Charlie and Lola: My Dancing Sticker Book Puffin A Charlie and Lola sticker book, all about dancing, from Lauren Child. Lola really wants to learn to dance, but all the different kinds of dancing that she tries are too difficult or too floaty or too tappy. 'Oh!' says Lola. 'I don't think I am good at ANY kind of dancing.' Will Lotta and Charlie be able to cheer her up? A favourite Charlie and Lola sticker book, now reissued with an especially new cover. Based on the award-winning books by Lauren Child, Charlie and Lola is now a top-rated BBC children's television show and a huge international hit. Lauren is also the multi-talented prize-winning creator of Clarice Bean and co-creator of the widely acclaimed The Princess and the Pea. Lauren lives in London. Charlie and Lola is produced by Tiger Aspect Productions, one of the UK's most successful and prolific independent television producers of shows such as Robin Hood and The Catherine Tate Show. 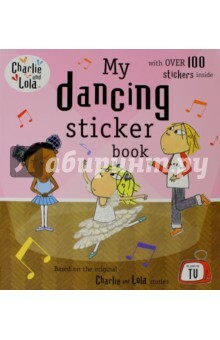 Аннотация к книге "Charlie and Lola: My Dancing Sticker Book"
A Charlie and Lola sticker book, all about dancing, from Lauren Child. Lola really wants to learn to dance, but all the different kinds of dancing that she tries are too difficult or too floaty or too tappy. 'Oh!' says Lola. 'I don't think I am good at ANY kind of dancing.' Will Lotta and Charlie be able to cheer her up? A favourite Charlie and Lola sticker book, now reissued with an especially new cover. Based on the award-winning books by Lauren Child, Charlie and Lola is now a top-rated BBC children's television show and a huge international hit. Lauren is also the multi-talented prize-winning creator of Clarice Bean and co-creator of the widely acclaimed The Princess and the Pea. Lauren lives in London. Charlie and Lola is produced by Tiger Aspect Productions, one of the UK's most successful and prolific independent television producers of shows such as Robin Hood and The Catherine Tate Show. –20 % Выгода 89 ₽ Peppa Pig: Peppa Goes to Hospital: My First Storybook 4 рец. –27 % Выгода 120 ₽ Dentist Trip 2 рец. –27 % Выгода 120 ₽ George's First Day at Playgroup 3 рец. –27 % Выгода 120 ₽ George's New Dinosaur 3 рец. –27 % Выгода 120 ₽ Peppa's First Pair of Glasses 2 рец. –27 % Выгода 180 ₽ Stcker Book 3 рец. –27 % Выгода 167 ₽ Peppa Pig. Peppa Hide-and-Seek. Search & Find Book 2 рец. –27 % Выгода 120 ₽ Peppa Pig: George and the Noisy Baby (PB) 1 рец. –27 % Выгода 120 ₽ Peppa Pig: George's Balloon (PB) 2 рец. Если вы обнаружили ошибку в описании книги "Charlie and Lola: My Dancing Sticker Book" (автор Lauren Child), пишите об этом в сообщении об ошибке. Спасибо!